Nimble Cities: Can eliminating parking spots make cities more efficient? How eliminating parking spaces could make cities more nimble and efficient. Friday is Park(ing) Day, a global event where metered parking spaces are turned into temporary parks to encourage people to reconsider how we use urban spaces. In 2010, Tom Vanderbilt wrote about how eliminating parking spaces could be a good idea for cities. The essay is reprinted below. In reading about creating nimbler cities, I have picked up a few discernible trends. One is a tilt in favor of the hypothetical: new technologies or entirely new types of transportation. While this blue-sky thinking is certainly welcome, I’d love to hear more about all the good ideas that are being tested out right now, in some city or another. Another trend: ideas for improving urban parking. And in particular, for reforming (or even doing away with) municipal parking codes. Such proposals appeal to me for a few reasons. For one thing, parking is a huge, if typically overlooked, part of the traffic equation. Storage is a key part of our automobile networks, and cars are stored quite a bit: Cars spend, on average, 95 of their time simply parked. For another, such plans are counterintuitive: It’s odd for planners (one took pains to indicate he was not a libertarian) to advocate actually doing away with planning regulations. The third is that many cities have already begun to experiment with their parking codes, providing not tantalizing “what ifs” but useful case studies. Unless you are involved in transportation, local government, or real estate, the words minimum parking requirements may be unfamiliar to you. And yet their influence is all around you. Parking minimums are municipal provisions that require developers building a new project—whether commercial or residential—to also construct a minimum number of new parking spaces, often without regard to the presence of nearby transit options or even actual need. As a report by the Institute for Transportation and Development Policy has noted, parking minimums initially took hold in the middle of the last century, as a way to ensure that traffic to new developments (built by developers who were understandably loathe to spend money on comparably unprofitable parking) wouldn’t gobble up existing spaces. Eventually, such minimums were viewed as part of an essential strategy for helping downtown businesses compete with the growing suburbs. And, on the face of it, this policy seemed a good one: Wouldn’t forcing developers to build parking help alleviate the parking problem and thus the traffic problem? Shoup argues that minimum parking requirements are based on a form of “circular logic,” in which planners estimate parking need by looking at the highest levels of parking demand at suburban locations with free parking and no transit options. As a result, the space devoted to cars often exceeds the space devoted to humans (one study found mall parking lots were 20 percent bigger than the buildings they serviced), and the country is awash in a surplus of parking supply. In Tippecanoe County, Indiana, for example, a group of Purdue University researchers noted, “[I]f all of the vehicles in the county were removed from garages, driveways, and all of the roads and residential streets and they were parked in parking lots at the same time, there would still be 83,000 unused spaces throughout the county.” And as Shoup argues, there is nothing free about this parking—everyone, even those who don’t drive, pays for it in one form or another, whether the invisible parking surcharge is built into retail prices or the various costs associated with parking-lot storm-water runoff. But it’s not only in sprawling suburbs that the influence of parking requirements is felt. In New York City, 1960s-era zoning requires new residential developments to supply eight times as much off-street parking as existing housing offers—even in walkable, transit-heavy neighborhoods. For example, I live in a mid-19th-century building, one block from the subway, that has precisely zero dedicated parking spaces. A few doors down, there is a planned luxury condominium development (which has been festering through the financial crisis) that for now consists of an exposed underground parking garage. The parking is offered not as a luxury amenity (though adding parking adds an estimated 10 percent to the cost of development projects) but to meet a legal requirement; it would actually be more difficult for the builder not to include parking than to simply toss it in. (Even city dwellers who don’t want cars have to fight to not include parking at their houses.) At a local community meeting, the developer argued that his planned garage would help alleviate neighborhood traffic. But the logic here is backward. In New York City, access to dedicated parking means one thing: more driving and thus more traffic. Some cities are beginning to look anew at parking. 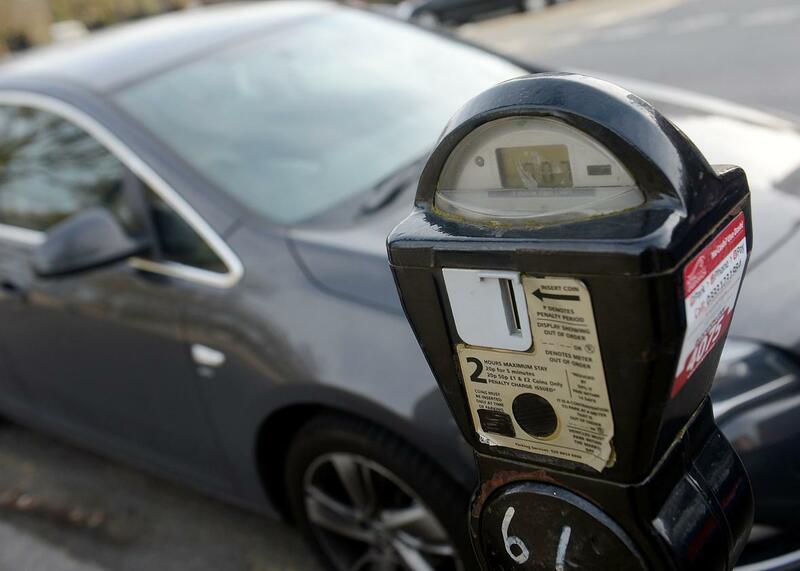 In Columbus, Ohio, the very birthplace of minimum parking requirements, the city recently cut the amount of parking required at shopping malls by 20 percent. (Studies had found most lots were half empty.) Last year, Washington, D.C., changed parking requirements for the first time in half a century, doing away with a law requiring parking for retail developments in high-density areas. San Francisco’s SF Park program (inspired by the idea, most famously proposed by Shoup, that on-street parking should be priced according to real-time demand and to an ideal 85 percent occupancy level) is using sophisticated sensors to track parking spot availability and match drivers with spaces. Hoboken, New Jersey, meanwhile, has debuted a network of shared cars (managed by Hertz) that can be picked up and dropped off right on dedicated curb parking spaces (90 percent of residents live within a five minute walk of a space) in the city. Managing parking is a key part of improving urban transportation in the upcoming century, though, as always, the solutions will depend on how the problem is defined.